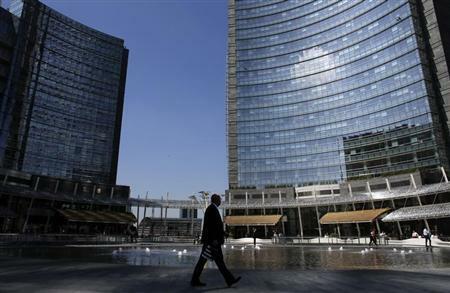 MILAN (Reuters) - A drive by Italian banks to come clean on bad loans during a European bank health check may force them to raise as much as 20 billion euros in capital, three times more than that penciled in so far, to shore up their balance sheets. The bad debts are a problem that Italian banks had swept under the carpet because booking soured loans at market value would open a big hole in their accounts. But the industry health check is forcing them to clean their books to try to get an early claim on investor cash they will need to rebuild their capital. Five banks already have capital increases in the pipeline for 7 billion euros, with mid-sized lender Carige confirming on Thursday it was looking to tap investors for 800 million euros as planned asset sales were not going ahead quickly enough. But now it looks like the industry will need more and may have to compete for it with others in the euro zone when bank health check results are revealed in October. Bad loans are a major headache for Italy's banks because the country's weak economy has led to an increase in defaults. They are sapping profits and exacerbating a credit crunch that is holding back an economic recovery. Non-performing loans - least likely to be repaid - soared to a record 156 billion euros ($213.92 billion) in December, twice the 2010 level. Lenders have already had written 76 billion euros off the value of those loans, partly in response to demands from the Bank of Italy which, since the end of 2012, forced them to set aside more cash against expected losses. But bad debt experts think the banks need to take further write-downs of at least 20-25 billion euros to get buyers specialized in distressed debt to take them off their hands. "The issue right now is that even after a 50 percent write-down, the value is still too high. They'd need to lower it by another 20-25 billion euros," Andrea Perin, head of structured finance at Finanziaria Internazionale, a firm that specialises in securitizations and invests in distressed assets, said. The industry's bad debt foot-dragging partly reflects its view that it is in a stronger position than peers in Spain and Ireland - which set up state-sponsored bad banks for their lenders' toxic assets as part of a European bailout. Unlike Ireland and Spain, Italy has not had a real estate bubble. But Italy's industrial output shrank by about a quarter during the financial crisis as thousands of small businesses that form the backbone of the country's economy went bankrupt. Authoritative think tank Prometeia expects bad debts to keep rising through 2016 even though the Italian economy is showing the first signs of recovery. Riccardo Serrini, head of Prelios Credit Servicing, part of property firm Prelios managing banks' non-performing loans, said an even bigger haircut on those debts was necessary to lure foreign investors such as hedge funds. With the cash-strapped, outgoing Italian government opposed to a publicly-funded bad bank, lenders are having to devise their own solutions to clean up their books. The country's two biggest banks, Intesa Sanpaolo and UniCredit , are in talks with U.S. private equity fund KKR to pool restructured loans in a special vehicle, sources said this month. KKR could take an equity stake, leaving the banks with minority holdings so they can take the debts off their balance sheet. Another option would be for the vehicle to issue notes to KKR or other investors with the loans as collateral. Intesa is also working on an internal "bad bank" for a chunk of its problem loans, while UniCredit has been selling batches of bad debts to two of the biggest international names in the business, Cerberus and Anacap. But while those two banks have the clout to deal with their soured debts, smaller players may struggle to absorb the capital hit without turning immediately to the market for funds. Serrini said most banks would be able to sell only small pools of bad debts, carefully picking loans that have already been properly written down, until the outcome of the European bank health check forces some to beef up their capital. "For the cooperative lenders it's a big problem - either they sell their bad debts or find a way around that through some sort of joint bad bank or they won't be able to save themselves," Vincenzo Macaione, chief executive of non-performing loan specialist Primus Partners, said. Backed by Barclays and Deutsche Bank , Primus Partners is studying deals to securitize and sell bad loan portfolios of Banco Popolare and Veneto Banca and expects to announce two operations by June. Whatever the solution, it will not be pain-free. Macaione expects write-downs on bad debts to reveal a capital shortfall of 15-20 billion euros, above worst-case-scenario estimates of 14 billion euros by the International Monetary Fund. That would imply the capital increases penciled in by five of the 15 Italian lenders under scrutiny in the European health check will not be enough to shore up Italy's mid-tier lenders.